Sure, actual economic reports occasionally have had some influence. For example, last week’s weak EU GDP figures had some fleeting effect. Therefore with the above in mind, note how most of the below market movers are variations on at least one of the above 3 types of top market moving events. Market interpretation and reaction to the G20 statement this past Saturday is likely to influence a number of markets in a number of ways. Japanese stocks, and to a lesser degree other Asian stocks, have been moving mostly with hopes of a cheaper Yen driving exports and earnings. Over the past week the big threat to the JPY downtrend and Nikkei uptrend was that the G7 and G20 statements might reflect opposition to the ongoing JPY debasement. They didn’t, so expect both trends are free to continue, possibly with a big move early in the week that reflects the collective sigh of relief over the passing of the threat to these trends. However, note that both trends have been continuing relentlessly for months and could easily see at least a temporary reversal. Some big players have likely closed out their short positions. For example, George Soros recently bragged about his successes shorting the JPY. We suspect he wouldn’t be doing that if he were planning additional JPY short positions. Now that further Yen depreciation is likely, this could be the week that Korea, China, and other Asian exporters decide to take at least some initial steps to defend their exporters. Here’s what could rattle the prevailing calm on the EU that has been so important to the ongoing rally in risk assets. There are elections in both Cyprus and Italy this week. A win for the anti-austerity forces could complicate and already complicated bailout negotiation and raise risks of a Cyprus default. The big problem is that Germany will want reforms that cut off a big source of Cyprus bank business – aiding EU tax evaders. However if history is any guide, Germany will back down due to fear of contagion risks, despite Cyprus’s minor role in the EU, as it did with Greece. This weekend we’ve Italian elections. The outcome is particularly uncertain, but there’s a good chance that a number of the outcomes will undermine market faith in Italy and send its borrowing costs higher. If those rise high enough, that alone could shake overall confidence in the EU and raise borrowing costs of other GIIPS nations. The return of former PM Berlusconi as a partner in the new ruling coalition. His anti-austerity stance threatens to unsettle market confidence. Indeed, Italian bond yields have started to rise again since polls began showing his resurgence. An unstable coalition of convenience with parties of disparate agendas that reduces Italy’s ability to make progress on reforms and thus also undermines market confidence. That too could mean higher borrowing costs, lower stocks, and rising concern about Italy that risks undermining confidence in the EU and hurting borrowing costs for other GIIPS nations, especially…. Spain has 3 bond sales this week. Uncertainty from the above elections could mean higher bond yields. That alone could undermine a fading confidence in Spain, which is already under a cloud of uncertainty from an ongoing corruption scandal. So far no one is worried, but if it appears more likely that the US sequester due to hit March first will actually take effect and bring mass layoffs of government workers, that too could spark profit taking in risk assets beyond America’s borders. Here are the most likely market moving events not mentioned above. EU: Spain and France both auction benchmark 10 year bonds. These longer maturity notes aren’t backed by the ECB’s LTRO program, and so present a bigger test of market confidence for the #2 and #3 economies in the EU. Lurking behind market reaction to headlines is the knowledge that most risk assets remain near decade highs despite the fact that the usual cheery fundamentals that justify such valuations aren’t there. See our article here and here for details. That makes stocks and other risk assets vulnerable to profit taking, especially because the index hasn’t had a normal ~10%-15% correction in over half a year. 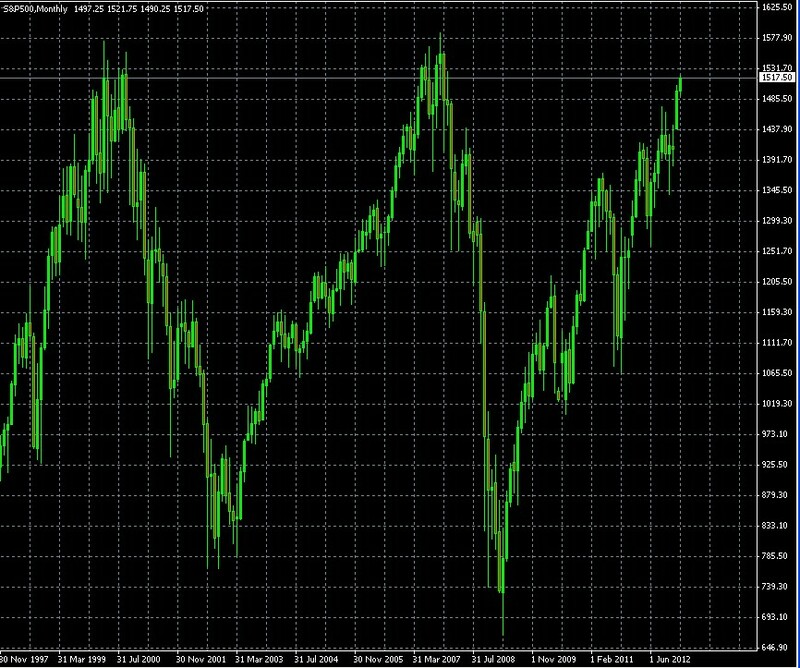 Look at the long term S&P 500 chart below. Would you take new long positions in stocks, or any asset that moves in the same direction (like the EURUSD, AUDJPY, oil, etc) given what happened the last two times the index was at these levels? Only if you were a very short term trader. The prominence of ongoing stimulus programs (aka money printing and currency devaluation) and complacency on the EU crisis (future disaster to be solved or at least stabilized with the same kinds of policies) mean that those of us with most of our assets linked to the USD, EUR, JPY and other currencies at similar risk of debasement need to consider how we’ll protect ourselves and prosper. 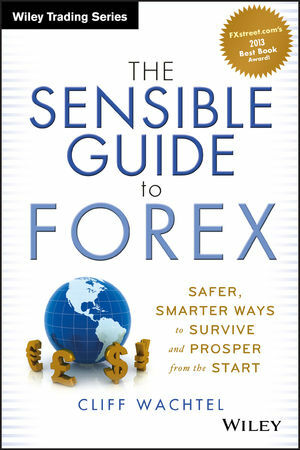 See here (non-US residents) and here (US residents)for details on the most up to date collection of a range of safer, less demanding solutions than commonly found in guides to forex or overseas investing.